The global community expects companies to operate with due respect for human rights. Beyond meeting regulatory requirements and social expectations in countries and regions in which we operate, we are strengthening our commitment to human rights by proactively introducing more rigorous international standards such as the United Nations Global Compact and ISO26000. Human rights are the basic rights that every individual is entitled to, and the issues related to them are both far-reaching and complex. Ricoh's respect for human rights stretches back to our company's foundation, when "love your neighbor" was set as one of the key components of our corporate philosophy, The Spirit of Three Loves. Exemplifying the continued application of this tenet are measures we take to ensure there is no child labor or forced labor, not only within our own organization but within our supply chain as well. We mandate the Ricoh Group Supplier Code of Conduct and regularly monitor our suppliers to make certain they are complying with the code through CSR self-assessment reports. Deviations from the code are expected to be corrected immediately.We also carry out our on-going commitment to address the controversial issue of conflict minerals* and disclose related information. *The “Conflict Minerals Issue” is a issue in which the profits from minerals mined or traded finance armed groups and foster conflicts, and often involves human rights abuses, labor issues and environmental destruction, etc. The Dodd- Frank Wall Street Reform and Consumer Protection Act, enacted in July 2010, requires specified companies to report the use of conflict minerals--tin, tantalum, tungsten, and gold--and any other minerals determined by the U.S. Department of State which originated in the Democratic Republic of Congo and/or an adjoining country. Our respect for human rights also extends to the health, security and safety of our customers. We pursue this objective in various ways, from making products easier to use to promoting "color universal design," which takes into account the diversity of color vision among the people of the world. As one of the leading global companies, we recognize respect for human rights as the basis of our social responsibility and will continue to fulfill our duties to protect and promote human rights. Human rights due diligence is a process that companies undertake to identify, prevent, and mitigate any negative impact on human rights. The Human Rights Enlightenment Committee was established and staff in charge of human rights enlightenment were assigned to each office and plant and the Business Assistance Division. A guidebook for enlightenment of human rights "Hito-o Aisu (Love your neighbor)" was issued and education to raise awareness of human rights was initiated. The Human Rights Counseling Center was established. Operation of a database on human rights and sexual harassment was initiated. The company signed the United Nations Global Compact (UNGC). Respect for basic human rights was clearly stipulated in the Ricoh Group CSR Charter and the Ricoh Group Code of Conduct. The human rights standard was established. The Ricoh Group Supplier Code of Conduct was established, which requested that suppliers respect basic human rights, and in 2009 the self-assessment system was established. An organization to promote "diversity & work-life management" activities was established. Color universal design activities (in consideration of the diversity of color vision) were initiated. The company signed the CEO Statement for the 60th anniversary of the Universal Declaration of Human Rights (UDHR). The company signed the United Nation's Women's Empowerment Principles. A stakeholder dialogue on human rights was held. The company announced its policy on conflict mineral issues. Conducted e-learning program for all employees. Working group on conflict minerals launched. Workshop on human rights due diligence is held. An e-learning program on human rights was conducted for all executives and employees of affiliated companies in Japan. The Ricoh Group Supplier Code of Conduct was revised to include requests for suppliers to address the issue of conflict minerals. The human rights standard was revised based on international norms. Human rights and labor assessments were conducted at four overseas affiliated manufacturing companies in China and Thailand. Our respect for human rights prioritizes due consideration for all stakeholders associated with corporate activities and requires that each and every employee who is involved in daily operations has a proper understanding of human rights and a deep awareness of human rights issues. In fiscal 2012, Ricoh conducted the e-learning program, "Corporate Activities and Human Rights," as human rights education for all of its executives and employees. Along with a working group on conflict minerals launched together with affiliated companies based in Japan in fiscal 2013, the e-learning program proved to be effective in deepening executives′ and employees′ understanding of the importance of carrying out their daily business activities in such a way as to meet the expectations of the international community regarding human rights issues. Because of this success, in fiscal 2014, the e-learning program was also provided to every executive and employee of affiliated companies to ensure that respect for human rights becomes an integral part of each company′s culture. Furthermore, the Ricoh Group′s human rights standard was drastically revised for the first time in 10 years to reflect current international human rights norms so that such norms can be checked anytime and anywhere. - Change in awareness: 94% replied that they would incorporate human rights considerations into their daily business practices. - Level of understanding of the program: 80% replied that they either "nderstood very well" or "understood well." These two figures outperformed post survey results for the human rights e-learning program conducted within Ricoh in fiscal 2012 by 10%, which is largely due to the following two reasons. First, the number of opportunities for employees to come into contact with information on the international human rights movement via the media and the Internet had increased over the years. Second, employees had gained deeper knowledge and understanding regarding the international human rights movement through activities of the working group on conflict minerals launched in fiscal 2013. We assess the human rights risks in the supply chain on an annual basis to identify risks of great social concern and to set target areas. To date, we have assessed suppliers in Japan (FY2009 - FY2011, FY2015), China (FY2010, FY2012, FY2014), Thailand (FY2013, FY2016). 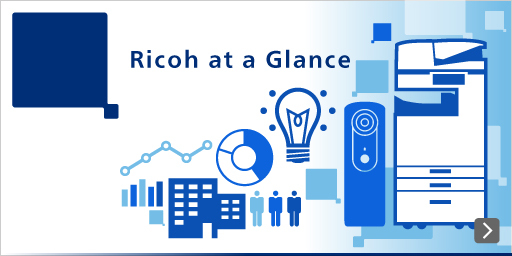 For assessments in 2017, we focused on suppliers started business with Ricoh in our new business domain. In FY2016 we conducted on-site audits to Ricoh Asia Industry (Shenzhen) Ltd., one of the production sites in China. The audit conducted by a third party was based on the internationally acknowledged standards, i.e. the ten principles of UN Global Compact and ISO 26000, etc. As a result, some corrective actions were identified, but we were able to confirm that their operations were carried out in compliance with the international standards and their equivalents. In FY 2017, we created a self-assessment format based on major international human rights standards in line with the UN Guiding Principles on Business and Human Rights. The format was created as a guideline to ensure our affiliated companies can fulfill social responsibilities as well as compliance with laws but also to promote social and environmental responsibility and business ethics. We carried out a trial assessment with the new format. Ricoh group recognize that the procurement of some minerals from states in conflict areas and other high-risk areas may become sources of human rights abuses and labor problems, etc. In order to prevent the occurrence of problems, we are conducting investigations of responsible mineral resource procurement in cooperation with suppliers every year since FY2013. And at the same time, we are continuing due diligence activities cooperating with industry groups. For identifying human rights risks in supply chain which risks are of great social concern, we regularly assess the human rights risks in the supply chain by setting target areas on an annual basis. To date we have been assessing suppliers in Japan (FY2009 - FY2011, FY2015), China (FY2010, FY2012, FY2014), Thailand (FY2013, FY2016). In 2017, we conducted assessments focusing on suppliers who initiated transactions in Japan. In FY2016 we conducted on-site audits to Ricoh Asia Industry (Shenzhen) Ltd., one of the production sites in China. This was an audit by a third party based on the international norm, i.e. the ten principles of UN Global Compact and ISO 26000, etc. As a result, we confirmed that there were few correction items and they have been conducting business activities in compliance with the international norms and their equivalents. In FY 2017, we created a self-assessment sheet based on major international human rights standards in line with the UN Guiding Principles on Business and Human Rights. We carried out a trial assessment so that affiliated companies can fulfill social responsibilities as well as compliance with laws but also to promote social and environmental responsibility and business ethics. The Ricoh Group has issued Slavery and Human Trafficking Statement in accordance with the UK Modern Slavery Act 2015. The Ricoh Group as a global citizen, while being conscious of the respect for human rights of all the stakeholders involved, will surely pursue the human rights due diligence.